Come and discover the Edge of the World from Stanley! What’s Included in our Stanley Tour? A cosy, sheltered harbour surrounded by numerous classic beach shacks, dotted with new contemporary home designs, and overlooked by lush Tasmanian farmland, Boat Harbour is a unique beachside paradise almost lost in time. 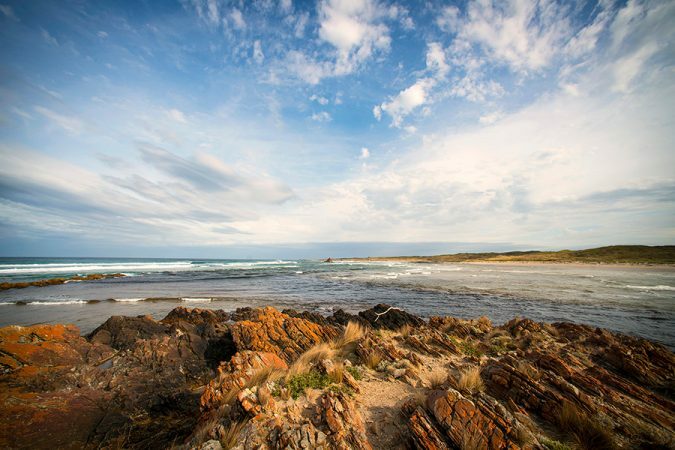 A tiny treasure – the effect that you get the first time you meander down the road from the Bass Highway and sight the pristine white sands of Boat Harbour Beach, and the impossibly blue waters of Bass Strait is simply breathtaking! Steeped in history, Stanley was discovered by Bass & Flinders in 1798 and named after Lord Stanley, the British Secretary of State for the Colonies. Aptly known as the ‘Edge of the World’, Stanley has also been named Tasmania’s premier Tourist Town than any other in the past decade. The town is filled with historic buildings, many over 150 years old, and including the birthplace of Joe Lyons, Australia’s only Tasmanian Prime Minister. The major attraction of Stanley is The Nut, which affords a great view right along the coast; the Nut itself is a volcanic plug which rises some 152m (492 ft). If you are feeling energetic, you can climb the winding path to the Nut’s plateau or, for a more relaxed version, hop onto the chairlift for uninterrupted views of Bass Strait….